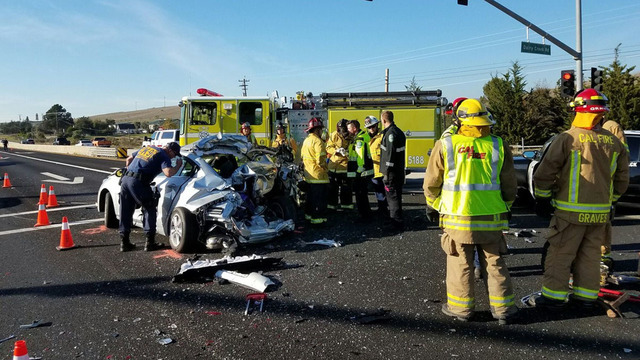 One person was killed and two were injured Wednesday afternoon in a three car collision near Cuesta College on Highway 1. At around 2:27 p.m., a San Luis Paper Co. and Janitorial Supply’s truck crashed into the rear ends of two southbound vehicles which were stopped at a red light at the intersection of Education Drive and Highway 1. The crash projected a silver car carrying two out-of-area residents across the highway, killing one of the occupants. Another person sustained moderate injuries and two people had minor injuries. The driver of the third vehicle, a black truck, was uninjured. The name of the deceased has not yet been released pending notification of their next of kin. CHP officers are investigating the cause of the crash. I hate those lights on Highway 1. They make me nervous if I have to stop at them. One of the problems is that when the light turns green, your foot comes off the brake pedal so people approaching from behind just see the green light but don’t always realize that you aren’t moving yet. I try to flash my brake lights a couple of times to get their attention, but that doesn’t do any good if they aren’t paying attention. That gap closes really fast when you’re doing 65 mph and the car ahead of you isn’t moving. Did each truck hit a separete car? These trucks must of driven this route many times and should of been aware of the red lights. I don’t like red lights because of this as I too was a victem of being hit while stopped. It’s no fun and can change your life in a hurry. I feel sad for the innocent people that were injured and killed. Another case of texting or talking on a cell phone while driving? Clear, dry, red lights visible for a mile, and this truck driver just plows into stopped vehicles? Time to test him for all known drugs, including the newly legalized recreational pot. Now watch all the blunt-boosters chime in with their inarticulate defenses of doobies. I suppose it could be drugs but from my observations, it is far more likely to be distracted driving — probably involving a smart phone. What are your solutions to THAT situation? Don’t call them smart phones to start. Sounds like texting driver. There’s plenty of warning approaching those traffic signals. SL Paper better have good liability insurance or they’ll be out of business. Or the driver could use the same defense Catlin/Bruce Jenner used to get away with murder, but not sure the “I’m rich, a tv star, in the Kardashian clan, have lots of rich powerful friends and former Olympian” would work here. No there is not plenty of warning at that particular light, you come around a slight curve in the hwy and there isn’t much time to react if the light turns red, or if cars are already stopped for a red light reaction time is cut shorter. The lights here on hwy 1 remind me of all the lights that used to be on 101 in Santa Barbara, what a pain in the neck. They are a well run company with caring owners who have help this community for years. If the legal system puts them out of business there goes a lot of good peoples jobs. It is a tragic accident and that what insurance is for no more and not less. I wish I was as perfect as you.